Philip Reed is coasting toward retirement, looking for one last adventure, when he meets Bill Palis, a professional blackjack player and former member of the legendary MIT team that took the casinos for millions. At a blackjack table in a strip casino, Phil sees Bill win $1,600 in 20 minutes of play and he's intrigued. Initially, he plans to write the book as a spectator, but Bill encourages him to overcome his fears, learn to count cards, and get a piece of the action for himself. The two men form a friendship and begin traveling and playing blackjack together, often with Father Andy, who kicks in money so they can play out of a $30,000 bankroll. Phil, who has adult ADD, and flunked math in high school, adopts the challenge of card counting as a way to banish the old ghosts of his poor self-image and build new synapses in his aging brain. With Bill as his tough mentor, Phil struggles to learn the game and secretly track the cards. As Phil's play improves, Bill teaches him to disguise his wins and avoid scrutiny from casino security and the Orwellian "eye-in-the-sky" security cameras. Philip Reed punctuates My Piece of the Action with short, funny, informational sections on various gambling-related subjects. These sections step outside the main story and add depth by investigating different card counting systems, the danger of gambling addiction, interviews with memory experts, and secrets of dealers, pit bosses, and casino surveillance specialists. Throughout, he takes a humorous look at casino characters, even as he begins to sink into the gambling world himself. "How Philip Reed managed to write a book about life, death, faith, family, and infinity while at the same time learning to count cards and beat the casinos, I'll never know. But he did, and it's magnificent." "It sounds like an Elmore Leonard novel...a professional gambler, a sports writer, and a priest hit Vegas with a $30,000 bankroll. 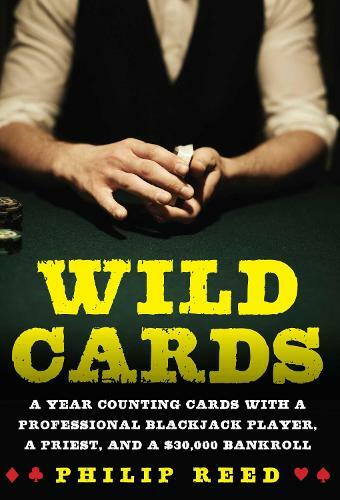 This is an exhilarating, wildly entertaining read that, as a bonus, will also teach you how to a win at the blackjack table. There's no risk involved in gambling on this book... it's a bet that's sure to pay-off." "The best description of the rollercoaster life of a professional blackjack player. Reed makes you feel you are at the table with big money on the line. I will encourage my students to read this book."